This case dealt with two relatively common problems. We had a pregnant patient who was both iron deficient and thrombocytopenic. Anaemia in pregnancy is fairly common. There can be a 45% increase in plasma volume which will cause a dilutional effect. There is also a 20% increase in red cell mass with a MCV that can increase by 6fL. Therefore microcytosis in pregnancy should be thought about. There is increased iron requirements for the mother. There is also often a neutrophilia and monocytosis during pregnancy. On the blood film there may be signs of ‘left shift’ where some more premature neutrophils are seen (band forms). Iron requirements are much higher in pregnancy due to foetal demands and the gastro-intestinal tract increases absorption by three times. There is a preferential delivery of iron to the foetus due to a heavy load of transferrin receptors on the trophoblastic membrane. What about haemoglobinopathy? Haemoglobinopathy is another cause of microcytic anaemia and in the UK all women have some sort of screening for haemoglobinopathy. At booking (usually 8-12 weeks) all women in high risk areas (foetal prevalence of sickle cell disease >1.5/10 000) will have a full blood count and haemoglobinopathy screen along with a family origin questionnaire. In low risk areas all women fill in the family origin questionnaire and have a full blood count. Haemoglobinopathy screen depends on the results of these two. The screening programme is designed to pick up serious haemoglobinopathy and carrier states; it is not designed to pick up HbH disease in the foetus, although often will. Why is iron deficiency in pregnancy important? There have been numerous reported side effects of iron deficiency. Most have been found during retrospective studies, so it is difficult to be certain. There is reports on increased risks of infection, fatigue, feeling cold, reduced cognition/memory, increased blood loss. Also correcting iron deficiency antenatally will reduce blood transfusion needs during the postpartum period. How to test for iron deficiency? If the routine blood count shows microcytic anaemia it is reasonable to assume this is due to iron deficiency and give a trial of iron whilst awaiting a haemoglobinopathy screen. If there is evidence of haemoglobinopathy then checking the ferritin would be required. Note – if there is a strong suspicion of beta thalassaemia trait (family history and persistent microcytic indices in the past and the HbA2 is normal it may be worth repeating the haemoglobinopathy screen when iron replete as iron deficiency can lower HbA2). A response to oral iron with rise in haemoglobin at 2-3 weeks is diagnostic of iron deficiency in this setting. If reticulocytes are given automatically then you would expect a rise with iron replacement but this is not needed for diagnosis. How to give iron? Generally 100-200mg of ELEMENTAL iron is needed. For example ferrous sulphate 200mg has 65mg of elemental iron. Compliance is key. Once the patient is iron deficient increased dietary iron alone is insufficient. When to check ferritin? If not anaemic but at risk (e.g. vegetarian, twins, heavy periods, very recent pregnancy, Jehovah Witness) or if haemoglobinopathy. There is no need for routine screening of ferritin. In pregnancy a ferritin of less than 30µg/L is diagnostic. What about intravenous iron? If intolerant of oral iron (try different preparations), if need haemoglobin to rise quickly (e.g. getting near to delivery or very symptomatic) or no response to oral iron/malabsorption issues. Don’t use in first trimester. Check that the drug is licenced. The risk of reaction with newer products is relatively low (reported as <1 in 200 000). What about iron for all? The WHO recommends low dose oral iron for all pregnant women. This may be appropriate for some countries. In the UK this is not standard practice. Compliance is an issue and side effects can occur. Also, there is a theoretical risk of iron overload in at risk patients (undiagnosed haemochromatosis) and also the risk of young children taking tablets. What if all investigations are negative? Most of the time patients are very well. In this case if no cause can be found the diagnosis lies between immune thrombocytopenia (ITP) or gestational thrombocytopenia. There is no test for either of these conditions. Generally if the platelet count is more than 70×109/L the diagnosis is felt to be gestational thrombocytopenia. 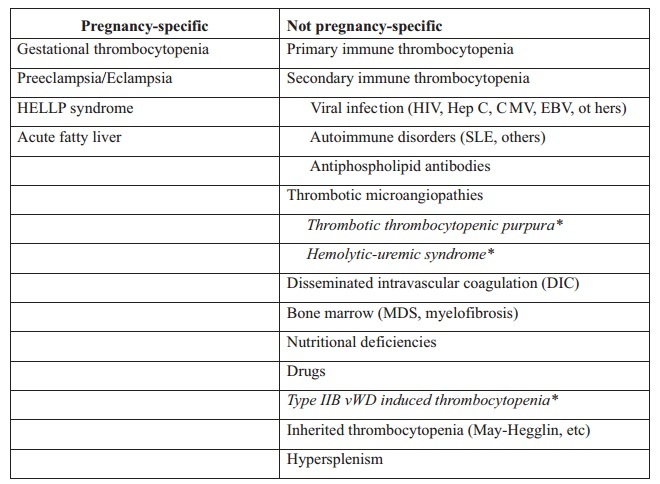 In gestational thrombocytopenia there is no risk to the woman or foetus during delivery. No foetal precautions are generally needed (unlike ITP). Gestational thrombocytopenia should resolve after delivery. What are the platelet counts needed for delivery etc.? Generally a platelet count of over 20-30×109/L is fine for pregnancy. Remember the pregnant patient is prothrombotic due to increased levels of fibrinogen, factor VIII, and von Willebrand factor; suppressed fibrinolysis; and a reduction in the activity of protein S. Specific platelet levels for different scenarios can’t be given as this depends on the patient, their symptoms, the procedure and the clinician. Generally a platelet count more than 40-50×109/L is fine for a vaginal delivery, over 50 x109/L for a Caesarean section and over 80×109/L for an epidural or spinal. Depending on details some anaesthetists may tolerate a lower level for a spinal depending on operator confidence, anatomy of patient and need to avoid a general anaesthetic. How to increase the platelet count? Low dose steroids (20mg prednisolone) or intravenous immunoglobulin can be used in ITP. She had a microcytic anaemia and had normal previous blood counts making haemoglobinopathy unlikely. She had heavy periods in the past and was on and off iron tablets. A trial of iron was undertaken and this was normal. She had a haemoglobinopathy screen and blood film – both of which were normal. She developed thrombocytopenia towards the end of pregnancy but the levels never went below 90×109/L. An HIV test was negative and her renal and liver function was normal. A repeat blood film was unchanged. There were no features of pre-eclampsia. No other investigations were performed. She had a weekly platelet count after 36 weeks and no intervention was needed. She was delivered a healthy baby girl without complications. An epidural was used. There was no bleeding complications. We hope you enjoyed this case! Knowledge of basic changes in blood counts are essential for appropriate investigation of pregnant women. Generally excessive testing is not required.